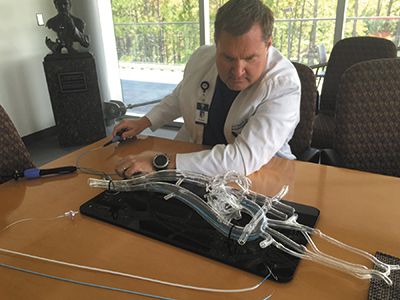 Macy Smith, MD simulates ablations using a cardiovascular model to enhance his zero fluoro Afib ablation techniques. There's something missing in Dr. Macy Smith's cardiac operating room these days: the use of a bulky fluoroscope, and the collection of leaded aprons needed to protect doctors, staff, and patients from the machine's continuous X-rays. "The mapping system is sort of like a GPS for the heart," says Smith, an electrophysiologist with Cardiovascular Associates. "When we do an ablation, the new system has special equipment and software that allows you to create a map of the heart almost like in a video game. By way of veins in the groin, you get your catheters up into the heart and move them around, and as you create contact at different points in the heart, you can see the catheters over a map that represents the geometry, or shell, of the heart. "With this system, we're able to rely more heavily on ultrasound, and merge that data into the system to get very nice pictures of the heart without fluoroscopy. Honestly, detail in X-rays was not that good. They show up dense objects such as bones and you get a sense of the cardiac silhouette, but the fine detail of the valves, the atrial structures and ventricular structures, is completely lost. There was a learning curve involved in the surgery for me, but the new method is so amazing that now I wonder how I did it the old way." The Zero Fluoro approach has had some unexpected benefits to the surgical team in addition to its safety component. "One of the things that surprised me is how much wearing the weight of that lead fed into my background consciousness, so that I had to devote some attention to supporting myself with that lead," Smith says. "I'm surprised how much better my focus is now that I don't have the lead pulling me down." Another major development in AFib treatment is the creation of a contact force sensor in the tips of the catheters used for ablation. "The trials have proven that the complication rates and cure rates are better with contact force sensing technology," Smith says. AFib is not as high-profile as coronary artery disease, but Smith says it's so widespread that it amounts to a building epidemic. One study shows that up to five million people in the U.S. have AFib and Smith estimates that fewer than 10 percent of those are receiving appropriate care. The disorder occurs when the heart takes on a rapid and irregular rhythm that tends to begin for brief periods that eventually grow longer, and can progress to a constant problem. "Over the long-term, this is very bad for your heart because that left upper chamber will dilate, enlarge, and develop scar tissue and the lower chambers weaken," Smith says. The increase in the prevalence of AFib is due to many factors. "We're living longer," Smith says. "Some of the triggers are obesity, hypertension, diabetes, sleep apnea, too much alcohol, and too much caffeine. "The normal course is that people have these spells and might just ignore them. Maybe they'll go see their primary care physician and by the time they get there, they're back in rhythm and it's assumed they're having panic attacks, or that it's all in their head. So people can go for years without a diagnosis." "The problem is that as it progresses from paroxysmal to more persistent, the stroke risk doubles and at that point it's harder to cure them with an ablation. This really disturbs me because AFib is my passion and the focus of my practice. The sad thing is that while it causes heart failure and even death, it's fairly easy to treat early on. One of my goals has been to try to improve public awareness so that there's less progression."